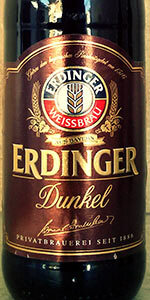 Labeled as "Erdinger Hefeweizen dunkel" in Germany -- tasted in Berlin. Served in 0.5l branded weissbier glass. Presented as a dark, ruddy brown beer with some near black depth. Think, creamy foam lace with lost of stamina. Slightly astringent, tight carbonation feel which induces a creamy mouthfeel and smoothness on the palate. Light malts, touch of chocolate, caramel and molasses. Hints of banana. Mineral body and flavour, with a thin citrus hop flavour that matches the malts and balances things out quite nicely. A most delicious dunkel weissbier. A highly recommended brew ... from this expert weissbier brewer. Appearance: Nearly black with hues of tarnished ruby, thick powdery tiny bubbled lace lays on top then drops down to a thin stable lace. Smell: Fruity with tones of prune and black currants, light alcohol esters are in the nose also. Malty with a mild spiciness in the aroma. Taste: Bold and crisp upfront with a spicy tingle that is enhanced by the medium leveled carbonation. Solid and clean maltiness on the palate, crisp snappish wheat with undertones of caramel and bread. Hops are subdued with little in the flavour, fruity from middle to end with dark fruit flavours. Mild cocoa and husk flavours drawn on a dryness, alcoholic esters gather towards the end. Dry in the finish though there are a few left over residuals in the mouth so hold the body together far into the end. Notes: Spicy with a clean zip, rich malty flavours from start to end. This makes for a near stellar brew of such a delicate style. Appearance  Very dark with a rising head that went down slowly. Smell  Nice, dark burnt malt aroma. Taste  Roasted malt flavors dominate this bier. The burnt nature of this ale works with a slight molasses sweetness to quench the pallet. Mouthfeel  Flat and smooth; medium-bodied. Drinkability  This went down well. Its definitely not a session beer, but probably a good one to have on tap if you can find it. Comments  This is currently labeled as a dunkel weitzen. It is completely off-style from this and is more like a classic German schwartz (black) bier. I rated this in accordance with this style. Poured into a hefe glass at Tiroler Hut in London. A- very dark with caramel brown highlights and a big fluffy white head holding some yeast. S- not a lot here. I was expecting banana, clove and a little roast, all I get is some sweet grain and corn. T- like the nose the flavor is seriously lacking. Grainy wheat and a hint of toasty bitterness, and some metallic yeastiness. M- medium to medium light in body but with the creamy wheat character and high carbonation I expect of a hefe. O- I was very disappointed by this beer. Fortunately I drank it after finishing my excellent Austrian meal so it did not get in the way of that. Deep kalamata olive that is tenaciously unyielding even when held directly in front of the afternoon sunlight. Its inflexibility prevents both highlights and clarity. Its frothy, staunch head rest in sepia tone. Although both persistent and adhesive, it seems stunted. The fact that it's served in the appropriate weiss glass makes it seem all the more squat for its style. The bouquet seems more than apprehensive to reveal itself. Deep breaths might discover subtle hints of over ripe apple or tannic grapes, but again these notes would be very subtle and these breaths would have to be really deep. All that is revealed is a standard note of wheat. It lacks the presence of clove, zest, and spice that more often accompanies it. No phenols, no esters - it is a bore. The taste is slightly less disinclined than aroma, although it too is lacking in almost every regard. The flavours are far from refined. Again, no phenols, no esters. Notions of zest, citrus fruit, banana and clove are rather abstract. There is no sense of caramelization. Even the wheat which (by law) makes up at least 50% of the grist is missing in action, I detect no rich malt, bread crust or grain taste. This mouthfeel could cause rioting in some parts of Bavaria. For one, I repeat: no phenols, no esters. Secondly, there is nothing effervescent about it. German wheat beers tend to have an intensely quenching character in large part to their high carbonation; the carbonation in this is pitifully low. There is no richness or fullness, nor is there anything quenching about it. I suspect Erdinger uses cheap ingredients. This could maybe pass as an American dark lager but not a true German dunkel. It may be dark but it is far from spicy, fruity, malty or refreshing. 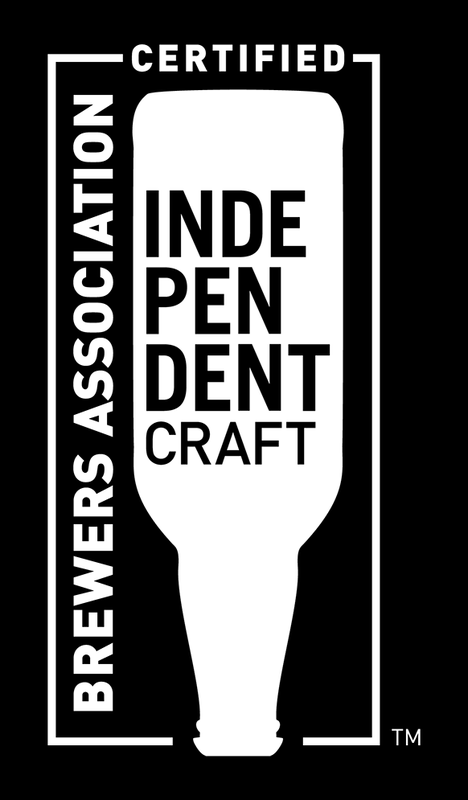 A real dunkelweizen should posses all the zesty yeast and citrusy wheat character of a hefeweizen and all the heavy, malty caramel richness of a dunkel (hence the damn name!) but this fails at both ends of its title. A: Pours a dark slightly translucent brown, with a large amount of light tan head. Enough of the head retains to leave good lacing. S: Sweet and malty with some hints of spices. T: Fairly malty, not too complex or really balanced but pretty decent. M: Medium to full bodied, medium to high carbonation. D: Fairly drinkable, and the ABV is pretty reasonable. Pours a dark brown with a beautiful foam and slightly tan head. Good creamy lace retains well. Nutty, hint of coffee and roasted malt aroma. Slightly sweet and lightly roasted malt taste. Creamy feel. Very smooth finish. Light to low medium body. Very good beer. Poured from a 16.9oz bottle into a US tumbler pint glass. A: The beer is a medium brown color, with a large beige head that fades quickly and leaves a spotty lace on the glass. S: The aroma is faint but contains wheat, caramel, dark malts and a faint touch of hops. T: The taste starts out bready with flavors of wheat and roasted malts. Then there are some semi sweet flavors of caramel and bananas that comes in. The hops presence is mild but complementary. The after-taste is slightly bready and slightly sweet. D: Tasty, goes down easily, not too filling, mild kick, good representation of style, this one is a little darker than most others I've had in the style, but it's a decent beer to drink for a while if you're in the mood for this kind of beer. Black wheat beer from Germany. The label says its refermented in the own bottle. I had to wait 10 days since i pulled all 4 wisdom teeth (31-oct-2009) to re-tasting beers. D: Very tasty, the best Erdinger i have proven. From 2012: Decent dunkelweizen, nothing stands out, but nothing lacking either. Flavor is good, but doesn’t stick around. I was hoping for much better from these guys. I actually liked this a lot. Not a style I get very often, and quite interesting and tasty. Pours a very dark, near black, into my Erdinger weissbier glass. Huge foamy head that almost screwed up my pour and flowed over the top. The dark beer looks really cool in this glass, though! Smell is a bit surprising -- hops, pine, grapes, cloves. Very fresh, although a bit of skunk in there, or maybe I imagined it. Interesting smokey flavour, nice hop/malt balance. Candy, bananas, grains, some pepper or spice, and a bit of caramel (not diacetyl though). Thick witbier mouthfeel, roasty toffee aftertaste. Honestly, even though I didn't give it the highest grade, I'll probably find some to keep in stock for a nice change of pace. Review according to BJCP2008 guidelines (style 15B). Bottle 50 cl - batch L041107. AROMA: faint wheat, caramel and vanilla notes. no hop aroma. APPEARANCE: dark brown color and opaque. thick tanned head with good retention. TASTE: some faint inappropriate roasted notes. faint wheat background. low bitterness. finishes somewhat sweet. no hop flavours. PALATE: medium-light body with some creamy sensation. moderate carbonation. OVERALL: a not very malty nor fruity nor spicy weizen. Dark brown pour. Heady beige foam atop. Spices, peat, and roasted malts in the nose. Flavours include sweet candy malts, a subtle spiceyness, with mild earthy peaty flavours in the finish. Medium light bodied, with a somewhat watery finish. No trace of the ABV. Pretty good Dunkel.